Which are the dates of your holiday? Try to picture a typical hillside village, surrounded by nature and overlooking the sea: what you’re imaging is the Parco Torre Chia Hotel. This recently built property has been designed to offer its guests the most relaxing and fascinating holiday ever. Can we help you to organise your holiday? ·Thanks to the Allianz Insurance Globy policy, for a small extra fee, the pre-paid services will be insured against unexpected cancellations. Why choose Parco Torre Chia Hotel? 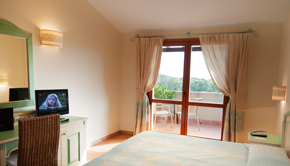 Some nice pictures of the Parco Torre Chia Hotel in Sardinia. 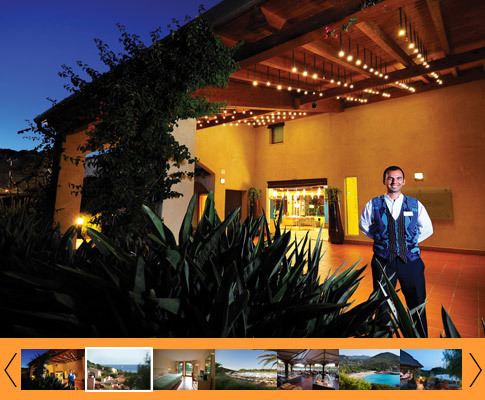 Why choose Parco Torre Chia Hotel? Because everybody loves nature, and this hotel is ideal for nature lovers and hikers: in fact it is located on a hill from which start the paths leading to the beaches and the Natural Park. The Parco Torre Chia is also designed for couples seeking a romantic escape from the city and for all people wishing to enjoy all the benefits that come from staying in a real park by the sea. Chia’s beaches and scenery are superb, the views from the top of the Torre Chia hill over both Torre Chia beach and the neighbouring beach are worth the trip alone, simply stunning! During our week’s stay there was no repetition in the main courses so the variety of food was good. 4 dessert options were available and desserts were very tasty indeed. A good range of fresh fruit was also available for a lighter/healthier dessert. The location is stunning, strolling distance to the beach (free bus to Tuerredda Beach was a real bonus too), swimming pool was lovely and the staff were so helpful and friendly. Restaurant food: buffet style. Michelin star dishes, different every day, superb wines. Great Italian food with traditional Sardinian dishes. If you really know or want to experience great Italian food...this is the place. We loved even the bread crumbs! Great hotel with beautiful surroundings. You could not have asked for anything more. The room was very nice and very clean. The front desk personel were always helpful and made great suggestions. I would highly recommend this hotel. Chia (pronounced Kee-a) is one of the most renowned resorts in Sardinia. There are many aspects of Chia that fascinate the visitor: the coastal ponds, regularly visited by various species of birds such as flamingos, or the seventeenth-century Spanish tower or the sand dunes modulated by the wind, and the cliffs along the coast. Sardinia Lovers is a brand specialized in holidays in Sardinia: by booking with us you will not only get the best hotel rates, but also the possibility of organizing flights, transfers, car hire and excursions by contacting a single operator. Our assistants on site will be at your disposal 24/7.